Expanding upon the ideas of screaming in The Shout, the analysis of Francis Bacon’s influence on counterculture British cinema can conclude with Don Levy’s 1967 film Herostratus. The film and its obsessions with textures and urban landscapes has already been discussed in other articles but Herostratus is full of other forms of terrain; the morphed and emotionally tortured form of the human frame and face. The full length of the film is somewhat expanded by long periods set in Bacon-like rooms full of black walls and spaces seemingly created out of void natures. If Bacon’s painting suggests one basic relationship between the sitter and their environment, it is that the space becomes devoid of any sense of dimension in order to accommodate the sheer sense of flux that occupies Bacon’s vision of the figures being painting. 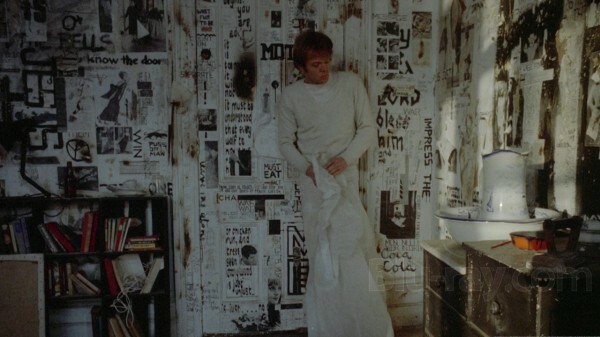 Herostratus builds on this by presenting the viewer with the troubled poet, Max (Michael Gothard), who is shown to both destroy and violently release his frustration in defined spaces (such as his own flat and the office building he storms into), and to be unnervingly static (physically) when in the void zones akin to Bacon’s paintings. Max wants to commit suicide and enlists a ruthless marketing company to make a spectacle of the event. He, however, doesn’t realise what this will mean for his death as a failed artist; the event will no longer be tragic but a seemingly ironic gesture instead. The failed poet rebels but succumbs to something much worse in his attempt to go through with the marketing company’s plans. In terms of swinging counterculture cinema, it is a foreboding breath of fresh air. The moments of channelling Bacon’s Head IV (and others) in The Shout fail to compare to Levy’s astonishing vision of their almost total and accurate transplanting onto his main character; seemingly tortured by both his desire to die and his growing reluctance to go through with his own death in the way that the company wants. 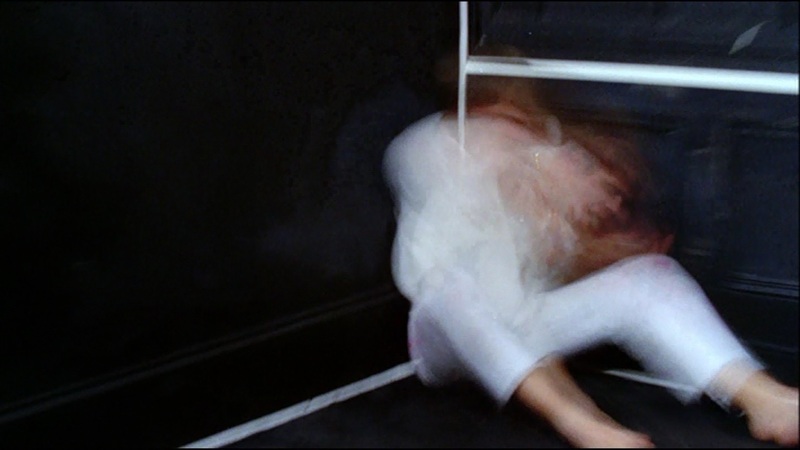 Levy shoots these moments in short bursts of montage where the chaos of the noise in the soundtrack suggests that Max’s melting screams and frenzied but contained, blurred movements are some form of mental attack; perhaps of indecision but more likely some form of genuine release of depressive frustration. After all, both Levy and Gothard would both take their own lives in later years so no doubt experienced some form of immersive and inescapably similar mental state. It’s unclear as to how Levy achieved this visual effect but essentially it seems to be some form of extreme motion capture set up with a high frame rate on the camera. Essentially though, it again suggests the previously mentioned aspects of Bacon’s work: that of the biology of motion but contradicted by a lack of actual spatial movement. In all of the paintings looked at within this essay, there seems to be an inherent contradiction where the areas set up around the figures trap them in a permanent state of motion almost as a form of torture. Emotionally, this is clearly where Levy’s character also resides being firstly trapped in a flat, caught in the empty high-rise streets of London and then finally in the void zones of the marketing company’s bedrooms. The second example in particular is interesting in that it is directly contrary to Bacon’s work; rarely are his paintings outside of four walls so to achieve this same sense of boxed-off mania but within the huge labyrinth of derelict London streets is itself a cinematic achievement. The frantic motion of Max’s head during these moments seems aesthetically similar to Bacon’s Head IV but also thematically different in certain regards. Whereas Max is almost at the mercy of an evil marketing oligarch in the form of Farson (Peter Stephens), Bacon’s screaming flux figures seem to be exerting power themselves. They are the power figures rather than the victims (unlike say in his Three Studies for Figures at the Base of the Crucifixion triptych (1944) which is explicitly the reverse) which perhaps makes Levy’s use of it within the film’s aesthetics doubly interesting. Bacon is channelling Velázquez’s painting of Pope X and is therefore making clear links between the mania of emotional exuberance and the absolute power of high level positions. Levy has taken Bacon’s idea and reversed this power relationship (used similarly to question such role reversals in The Shout), creating an aesthetic ploy to raise the emotional chaos exhibited by his main character to something that is on a deeply affecting and emotional level.